The Little Palm Island Resort & Spa is located in the Florida Keys and has been known for decades as the perfect, intimate getaway for those seeking both adventure and romance in their vacation. 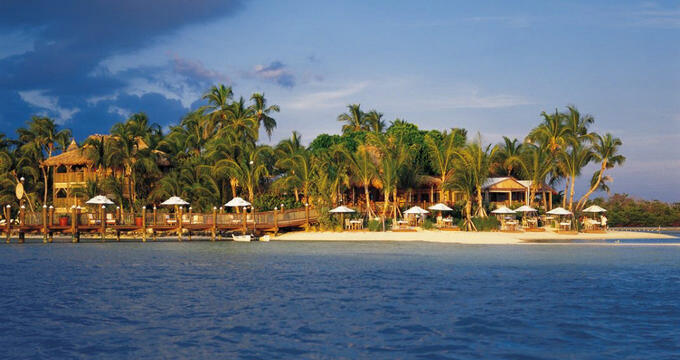 From early morning snorkeling, to champagne pouring, to completing the day in a secluded thatched hut, the Little Palm Island Resort & Spa is a Florida Keys gem. Island Escape Suite – The décor and design in the Island Escape Suite is truly representative to the Caribbean’s flavors and bright colors. Pops of turquoise can be found throughout, along with plush, white comfortable chairs, and complementing neutral accents. This suite is unique for its vaulted ceiling that converts into authentic thatched roofs. The Island Escape Suite is 550sf and ocean front. Amenities and accommodations include a separate living area, a king-size bed surrounded by butterfly netting and an outdoor, private, bamboo shower. In addition to the shower, there is a Jacuzzi-style whirlpool. This suite is air-conditioned and does not have an electronic in sight. A private verandah offers another space for guests to enjoy the mesmerizing ocean vistas. The Island Escape Suite is non-smoking and provides its guests with Keurig Coffee service. Island Elegance Suite - The Island Elegance Suite is 550sf with a tropical, Caribbean feel. An ocean side, private deck makes this suite unique. This suite has high, vaulted ceiling that rise to become thatched roofs. Guests are greeted at their Island Elegance Suite with a glass of champagne to start their vacation off right. The suite’s layout includes a separate living area for socializing or reading, with a king-size bed in the bedroom, adorned with butterfly netting. There is an outdoor, private bamboo shower along with an indoor separate shower room. For guests who like to soak, a Boudoir tub is also provided. The Suite is air-conditioned. There are absolutely no electronics in the Island Elegance Suite. A Keurig Coffee service is provided. The suite is non-smoking. 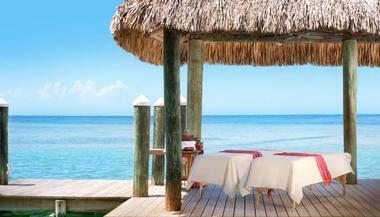 Island Romance Suite – With 550sf, this Caribbean-inspired Island Romance Suite is the perfect getaway for couples. This suite is envied for its oversized deck with ocean views, as well as its canvas drapes and spacious hot tub. Lush, green landscaping and bush surround the Island Romance Suite, making it feel even more of a secluded and intimate location. The Island Romance Suite, similar to the other suites, feature the same, high vaulted ceiling that eventually turn into a thatched roof. Fresh fruit and champagne await the guests. Amenities that are truly distinct to the Island Romance Suite include a Bluetooth speaker, circular daybed on the deck and a fire pit with lounging area. 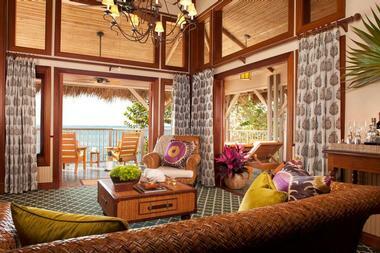 Island Grand Suite – This suite is the most requested of all suites offered at the Little Palm Island Resort & Spa. With 1,000sf, there is enough room for all the desired amenities and accommodations. Elegant décor spotted throughout the suite are British Colonial-inspired, blended perfectly with the tropical theme. The Island Grand Suite is a two-story suite, with a true open-concept floor plan and a bedroom that is separated from the living and dining area. Distinctive features include a spacious front porch complete with a cedar redwood hot tub, sandy socializing area next to a fire put and a perfect sunset spot from the verandah. The Little Palm Island Resort’s Dining Room is open for breakfast, lunch and dinner, and is open for business for guests of the resort as well as residents and locals of the area. Past diners at the Dining Room have especially enjoyed the Dining Room’s Sunday brunches, Wine Maker Events, and Full Moon Dinners. Proper clothing attire and reservations are required for all diners. Guests of the resort can also choose a Full Meal Plan, which allows them to order their food ahead of time. A variety of private, dining locations are also available to diners, including Harbor Point, Chef’s Table and Palapa Point. Diners must be 16 years old or older.